Homologous recombination helps ensure the timely completion of genome duplication by restarting collapsed replication forks. However, this beneficial function is not without risk as replication restarted by homologous recombination is prone to template switching (TS) that can generate deleterious genome rearrangements associated with diseases such as cancer. Previously we established an assay for studying TS in Schizosaccharomyces pombe (Nguyen et al., 2015). Here, we show that TS is detected up to 75 kb downstream of a collapsed replication fork and can be triggered by head-on collision between the restarted fork and RNA Polymerase III transcription. The Pif1 DNA helicase, Pfh1, promotes efficient restart and also suppresses TS. A further three conserved helicases (Fbh1, Rqh1 and Srs2) strongly suppress TS, but there is no change in TS frequency in cells lacking Fml1 or Mus81. We discuss how these factors likely influence TS. Problems that arise during DNA replication are thought to be the root cause of much of the genome instability, including duplications, deletions and translocations of chromosomal segments, that is associated with cancer and other disease states (Aguilera and García-Muse, 2013; Arlt et al., 2012; Macheret and Halazonetis, 2015). One common problem that arises is accidental collision of the replication fork with proteins that are tightly bound to the DNA (Lambert and Carr, 2013). Such collisions can precipitate a process known as replication fork collapse in which the protein components of the fork (collectively known as the replisome) are thought to partially or completely dissociate from the DNA (Cortez, 2015). In some cases this process may also be associated with DNA breakage, detaching one arm of the replication fork and exposing a single duplex DNA end. Replication fork collapse, either with or without DNA breakage, causes a localized cessation of DNA synthesis that can be remedied through the intervention of homologous recombination (HR) proteins, which restart replication. In eukaryotes, recombination-dependent replication (RDR) has been studied mostly in the budding yeast Saccharomyces cerevisiae, using experimental systems in which RDR is initiated from a site-specific DNA double-strand break (DSB) (Anand et al., 2013; Kramara et al., 2018; Sakofsky and Malkova, 2017). HR uses intact homologous DNA sequences as templates to repair DSBs and, if such sequences are available for only one side of the break, repair occurs via a RDR process termed break induced replication (BIR). In most cases, BIR has been studied outside of the context of S-phase, with a DSB, rather than a collapsed or broken replication fork, acting as its inducer. However, studies, using a site-specific single-strand DNA break to induce replication fork breakage, have shown that essentially the same BIR process can repair broken forks during S-phase (Mayle et al., 2015). Similar to other HR-mediated repair processes, BIR involves the 5’ to 3’ nucleolytic resection of a duplex DNA end to provide a single-stranded DNA (ssDNA) tail for the Rad51 recombination protein to load on to (Anand et al., 2013). In yeast, this loading reaction depends on Rad52, which acts as a mediator between ssDNA coated with the ssDNA-binding protein RPA and Rad51 (Krogh and Symington, 2004). Once loaded, Rad51 performs a DNA homology search, followed by strand invasion of the intact DNA sequence that it finds, forming a displacement (D) loop. The D-loop acts as a platform for replication protein reassembly, which seemingly involves most of the main replisome components (Lydeard et al., 2010). However, BIR exhibits a number of features that distinguishes it from canonical replication initiated from a replication origin, including: a requirement for the non-essential DNA Polymerase ∂ subunit Pol32 (Lydeard et al., 2007); a dependence on the Pif1 DNA helicase to promote DNA synthesis (Saini et al., 2013; Wilson et al., 2013); progression via a migrating D-loop or bubble resulting in conservative rather than semi-conservative replication (Saini et al., 2013); a massively increased rate of mutagenesis (Deem et al., 2011); an association with clustered mutations (Sakofsky et al., 2014); and an increased frequency of template switching (TS) (Smith et al., 2007). Given that a BIR-like process has been documented in human cells (Costantino et al., 2014; Roumelioti et al., 2016), it is highly likely that its error-prone nature and propensity for TS causes many of the mutations and genome rearrangements that are associated with cancer and other diseases. It is therefore imperative that the factors that influence BIR’s tendency to cause genomic change are identified, and their conservation of function in related RDR processes assessed, especially in the context of ongoing DNA replication during S-phase. We, and others, have documented a related process to BIR in the fission yeast Schizosaccharomyces pombe, which is induced by the RTS1 protein-DNA polar replication fork barrier (RFB), as opposed to a DNA break (Lambert et al., 2010; Miyabe et al., 2015; Mizuno et al., 2013; Nguyen et al., 2015). This form of RDR has been termed homologous recombination-restarted replication (HoRReR) (Miyabe et al., 2015) but, in this paper, we will refer to it simply as RDR. Replication forks collapse, and recruit HR proteins, within approximately 10 min of collision with RTS1 (Mohebi et al., 2015; Nguyen et al., 2015). Similar to BIR, Rad51 and Rad52 promote replication restart at RTS1 and, in doing so, can inadvertently cause genomic rearrangements through the recombination of repetitive DNA elements (Ahn et al., 2005; Lambert et al., 2005; Lambert et al., 2010; Mizuno et al., 2009; Morrow et al., 2017; Nguyen et al., 2015). Also like BIR, RDR induced by RTS1 is highly mutagenic and prone to TS (Iraqui et al., 2012; Mizuno et al., 2013; Nguyen et al., 2015). In this paper, we advance from our earlier study by identifying some of the key factors that influence TS during RDR, including key antirecombinogenic DNA helicases and collisions between restarted replication and tRNA transcription. We also highlight apparent similarities and differences between TS associated with BIR in S. cerevisiae and RTS1-induced RDR in S. pombe. In our previous study, we established an assay in S. pombe for studying TS associated with restart of a collapsed, yet unbroken, replication fork (Nguyen et al., 2015). Using this assay, we found that restarted replication is associated with high levels of TS similar to BIR in budding yeast (Nguyen et al., 2015). In S. cerevisiae, increased TS associated with BIR is only observed within the first 10 kb of template DNA that is copied, after which it drops to spontaneous levels (Mayle et al., 2015; Smith et al., 2007). In S. pombe, we observed high levels of TS at 12.4 kb downstream of the site of fork collapse but had not looked beyond this (Nguyen et al., 2015). To see if TS associated with RDR from a collapsed fork in S. pombe is similarly restricted to a ~ 10 kb region, as it is during BIR in S. cerevisiae, we used strains with a recombination reporter inserted at one of five different sites, ranging from 0.2 kb to 140 kb downstream of the RTS1 RFB on the right arm of chromosome 3 (Figure 1A,B). We also positioned RTS1 ‘within’ the reporter (we will refer to this as the 0 kb site) to monitor TS recombination during the initiation of RDR (Figure 1B). The reporter consists of a direct repeat of ade6- heteroalleles with an intervening his3+ gene (Figure 1B). A single TS between these repeats causes a deletion of the intervening region and formation of one ade6+ gene, whereas two TS events can convert one of the ade6- heteroalleles to ade6+. These events are distinguished by the loss/retention of the his3+ gene (Figure 1B). RTS1 is inserted close to a cluster of early firing replication origins (ori-1323, ori-1338 and ori-1342), which means that it is almost always encountered first by a replication fork moving in the telomere to centromere direction (Figure 1A). Therefore, as RTS1 is a polar RFB, it only blocks forks at this site in one orientation, which we refer to as the active orientation (AO) (Nguyen et al., 2015). The non-blocking orientation is referred to as the inactive orientation (IO) and acts as a negative control for our experiments (Nguyen et al., 2015). Indeed, the Ade+ recombinant frequencies, measured at the 35 kb, 75 kb and 140 kb sites are essentially the same with and without RTS1-IO (p > 0.4), and at the 0 kb, 0.2 kb and 12.4 kb sites RTS1-IO causes only a modest ~1.4–1.9-fold increase in deletions (p ≤ 0.001) compared to the spontaneous frequencies obtained from equivalent strains with no RTS1 (Figure 1C). 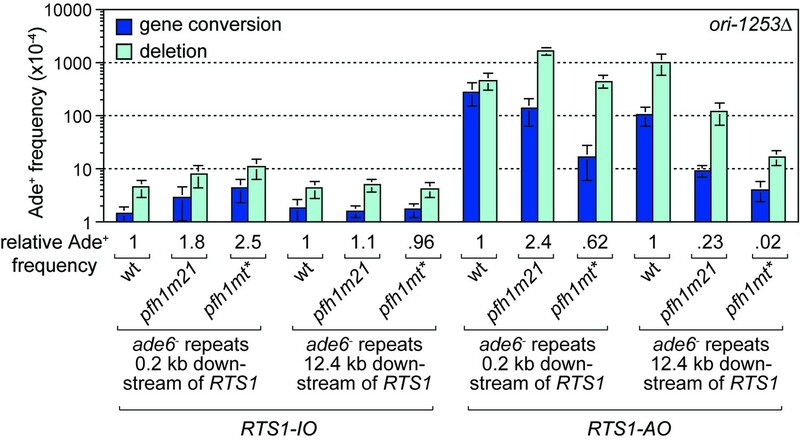 Compared to strains with RTS1-IO, those with RTS1-AO exhibited increases of between 32-fold to 133-fold in the frequency of Ade+ recombinants at sites up to 35 kb downstream of the RFB, but no increase was observed at the 75 kb and 140 kb sites (Figure 1C). (A) Map showing sites of insertion for the direct repeat recombination reporter on chromosome 3. (B) Schematic of the direct repeat recombination reporter showing the position of RTS1 insertion and two types of Ade+ recombinant. Asterisks indicate the position of point mutations in ade6-L469 and ade6-M375. (C) Ade+ recombinant frequencies for strains MCW429, MCW7229, MCW7429, MCW7430, MCW7297, MCW4712, MCW7131, MCW7257, MCW7565, MCW7614, MCW7326, MCW4713, MCW7133, MCW7259, MCW7567, MCW7616 and MCW7328. ‘0*’ indicates that RTS1 is positioned between the ade6- repeats. Data are mean values ± SD. Ade+ recombinant frequencies with statistical analysis are also shown in Supplementary file 1. In our previous study, we showed that convergence with a canonical replication fork limits the distance travelled by restarted replication and, therefore, determines the chromosomal region in which TS can occur (Nguyen et al., 2015). To see if the absence of increased levels of TS at the 75 kb reporter was due to replication convergence occurring upstream of this site, we deleted replication origin ori-1253, which is responsible for more than 80% of canonical forks that normally converge with the collapsed/restarted fork (Nguyen et al., 2015). 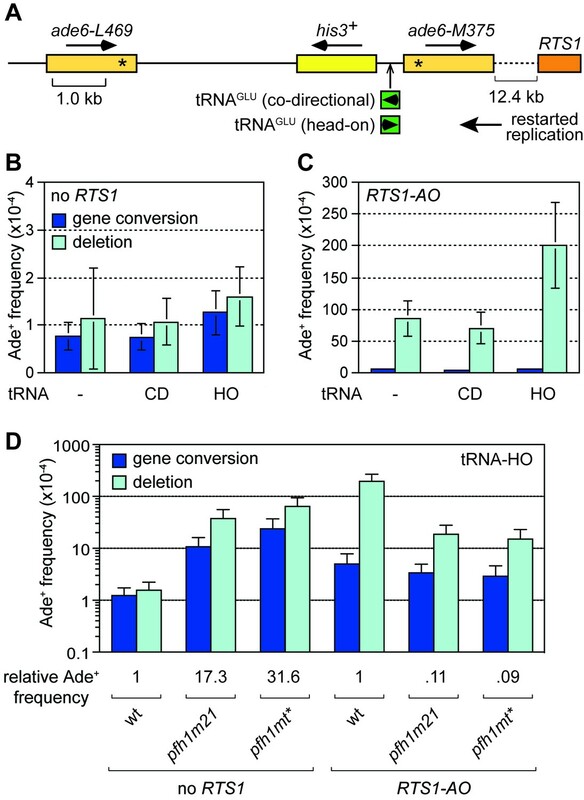 This deletion had no effect on the frequency of spontaneous recombination at the 75 kb reporter (p = 0.58 and 0.34 for gene conversions and deletions, respectively), whereas it caused an approximately 5-fold increase in deletions when RTS1-AO was present (p < 0.0001) (Figure 1—figure supplement 1). These data show that restarted replication can cause increased levels of TS at least as far as 75 kb downstream of a collapsed replication fork in S. pombe. The increases in recombinants up to 35 kb downstream of RTS1-AO are comparable to the 49-fold increase observed when the RFB is placed at the 0 kb site between the two ade6- heteroalleles (Figure 1C). However, at the 0 kb site, the fold increase in gene conversions is higher than that of deletions (by ~3:1), whereas, at the 0.2 kb downstream site, the fold increases in gene conversions and deletions are comparable (126-fold and 135-fold, respectively) and, at the 12.4 kb, 35 kb and 75 kb sites, the fold increase in deletions (42-fold, 58-fold and 4-fold, respectively) is much higher than for gene conversions (6-fold, 16-fold and 2-fold, respectively). These data suggest that during the initial phases of restarting DNA replication there is a greater likelihood of generating a gene conversion, whereas the TS associated with restarted replication is more likely to give rise to a deletion. In S. cerevisiae, efficient BIR depends on the Pif1 DNA helicase, which aids D-loop migration (Wilson et al., 2013). To investigate whether Pif1 is similarly important for RDR in S. pombe, as it is for BIR in S. cerevisiae, we made use of two mutant alleles of the S. pombe Pif1 gene, called pfh1-m21 and pfh1-mt*, which encode protein that localises normally to mitochondria but has greatly reduced (pfh1-m21) or no detectable (pfh1-mt*) nuclear localization (Pinter et al., 2008). This was important because Pfh1 has an essential mitochondrial function in S. pombe (Pinter et al., 2008). We first determined whether pfh1-m21 and pfh1-mt* affected the frequency of inter-repeat recombination in cells with the repeats flanking RTS1-IO or placed 0.2 kb or 12.4 kb downstream of it (Figure 2A). In the case of pfh1-m21, there was little or no effect on the frequency of Ade+ recombinants at the three sites (Figure 2A). The same is true for pfh1-mt* at the 0.2 kb and 12.4 kb reporter sites (Figure 2A). However, when the repeats flank RTS1-IO, the pfh1-mt* mutant exhibits an approximately 3-fold increase in Ade+ recombinants, which are mostly (87%) deletions (Figure 2A). This increase is more than the 2-fold increase observed in the equivalent strain with no RTS1 (Steinacher et al., 2012), which suggests that Pfh1 might be needed for aiding non-recombinogenic DNA replication past RTS1-IO. Effect of pfh1-m21 and pfh1-mt* mutations on TS recombination at and downstream of RTS1. (A) Ade+ recombinant frequencies for strains MCW4712, MCW4940, MCW4954, MCW7131, MCW7599, MCW7603, MCW7257, MCW7421 and MCW7425. (B) Ade+ recombinant frequencies for strains MCW4713, MCW4942, MCW4956, MCW7133, MCW7601, MCW7605, MCW7259, MCW7422 and MCW7426. Data are mean values ± SD. Ade+ recombinant frequencies with statistical analysis are also shown in Supplementary file 1. We next determined the recombination frequency in strains with RTS1-AO (Figure 2B). Consistent with previous data (Steinacher et al., 2012), we observed a greater than 7-fold increase in Ade+ recombinants in a pfh1-mt* mutant, compared to wild-type, when RTS1-AO is flanked by the repeats at the 0 kb site (Figure 2B, Figure 2—figure supplement 1). A similar increase was seen in a pfh1-m21 mutant and, in both cases, essentially all of the additional recombinants were deletions (Figure 2B, Figure 2—figure supplement 1). In contrast, the frequency of recombinants formed at the 0.2 kb and 12.4 kb reporter sites (by TS associated with replication restart) was reduced in both mutants (Figure 2B, Figure 2—figure supplement 1). Importantly, there were bigger fold reductions at the 12.4 kb reporter than at the 0.2 kb reporter, and with the pfh1-mt* mutant compared to the pfh1-m21 mutant (Figure 2B, Figure 2—figure supplement 1). These data show that there is a doseage-sensitive requirement for Pfh1 in promoting TS recombination downstream of RTS1-AO. This requirement might reflect a direct role in TS or a role in promoting replication restart. To determine whether Pfh1 is needed for RDR at RTS1, we analysed DNA replication intermediates in a ~ 3.7 kb Sac1 restriction fragment, that encompasses the barrier, by native two-dimensional gel eletrophoresis (2DGE) (Figure 3A,B). As seen previously, replication forks accumulated at RTS1-AO in both wild-type and pfh1-mt* mutant (Figure 3B) (Steinacher et al., 2012). However, whilst in the wild-type blocked forks were resolved through a mixture of restart (indicated by the presence of large Y-shaped molecules) and fork convergence at the RFB (indicated by the presence of double Y-shaped molecules), in the pfh1-mt* mutant they were resolved mainly by fork convergence (indicated by a reduction in large Y-shaped molecules and increase in double Y-shaped molecules) (Figure 3B,C). These data indicate that Pfh1 promotes efficient replication restart following fork collapse at RTS1. Pfh1 is needed for replication past RTS1-AO. (A) Schematic showing location of RTS1-AO and hphMX6 adjacent to bub1 on chromosome 3. The position of the probe used for the 2DGE analysis in B) is also shown. (B) 2DGE of replication intermediates in the SacI fragment shown in A). The DNA was extracted from strains MCW7223, MCW8587 and MCW8605. (C) Quantification of 2DGE. Values are relative to wild-type and are based on two independent experiments with each value represented by a dot around the mean. Intriguingly, we also observed the accumulation of a novel DNA signal running approximately parallel to the ascending arc of small Y-shaped molecules in the pfh1-mt* mutant (Figure 3B, labelled ‘e’ in the left hand panel). A similar signal was recently reported to accumulate in samples from rad51∆ and rad52∆ mutants, and was shown to depend on the 5’ to 3’ exonuclease Exo1 (Ait Saada et al., 2017). Based on these findings, it was proposed that Rad51 and Rad52 protect the collapsed replication fork from excessive Exo1 activity, which could generate extensively resected regressed replication forks (Ait Saada et al., 2017; Teixeira-Silva et al., 2017). To see if the novel DNA signal from pfh1-mt* depended on Exo1, we analysed replication intermediates from a pfh1-mt* exo1∆ double mutant (Figure 3B). This analysis showed that the novel signal was indeed Exo1 dependent. Exactly how Pfh1 prevents accumulation of resected replication forks is unclear. It may simply be a byproduct of its role in promoting efficient replication restart. Alternatively, Pfh1 may play a direct role in protecting the collapsed fork. Regardless of the mechanism, the similarly low levels of large Y-shaped DNA molecules, from both the pfh1-mt* single mutant and pfh1-mt* exo1∆ double mutant, indicate that Pfh1 does not simply counter Exo1 activity to promote efficient RDR. The discovery that Pfh1 is needed to promote efficient RDR, explains why TS downstream of RTS1-AO is reduced in pfh1-m21 and pfh1-mt* mutants. This finding also opened up the possibility that Pfh1’s function in promoting efficient RDR might mask a role for it in limiting TS downstream of RTS1-AO. To investigate this possibility, we tested the effect of deleting ori-1253 on the frequency of TS at 0.2 and 12.4 kb reporter sites in the two pfh1 mutants, reasoning that allowing more time for RDR might partially offset the need for Pfh1. In the control strains, with RTS1-IO, a modest increase in the frequency of Ade+ recombinants was observed at the 0.2 kb reporter (but not 12.4 kb reporter) in both pfh1 mutants, which might stem from fork collapse at RTS1-IO due to loss of Pfh1 ‘sweepase’ activity (see Discussion) (Figure 4). In the strains with RTS1-AO, the frequency of Ade+ recombinants increased at both reporter sites when ori-1253 was deleted and, whilst the frequency of gene conversions remained less in the pfh1 mutants than in wild-type, the overall number of recombinants in the pfh1-m21 mutant was more than 2-fold higher than wild-type at the 0.2 kb reporter due to a greater increase in deletions (Figure 4, Figure 4—figure supplement 1). These data indicate that Pfh1, in addition to promoting RDR, also limits TS recombination. Effect of ori1253∆ on the frequency of TS recombination downstream of RTS1 in wild-type and pfh1 mutants. The strains are MCW7414, MCW7598, MCW7602, MCW7293, MCW7423, MCW7427, MCW7416, MCW7600, MCW7604, MCW7295, MCW7424, MCW7428. Data are mean values ± SD. Ade+ recombinant frequencies with statistical analysis are also shown in Supplementary file 1. Collisions between replication forks and RNA Polymerase III (Pol III) transcription complexes at tRNA genes are known to stall fork progression (Deshpande and Newlon, 1996; Pryce et al., 2009). However, unlike at RTS1, fork stalling at tRNA genes generally only elicits detectable changes in recombination when in conjunction with other genetic elements that perturb DNA replication, or when there are defects in the replication machinery (reviewed in McFarlane and Whitehall, 2009). For example, work from our lab previously showed that loss of Pfh1 causes a ~ 27-fold increase in direct repeat recombination when DNA replication is stalled through head-on collision with transcription at a tRNA gene inserted between the DNA repeats (Steinacher et al., 2012). Whether this is also true for collisions between RDR and Pol III complexes has previously not been examined. To investigate the potential for TS to be triggered by collisions between restarted replication and Pol III complexes, we inserted a tRNAGLU08 gene between the ade6- heteroalleles at the 12.4 kb reporter site downstream of RTS1-AO (Figure 5A). As the orientation of collision between replication and transcription complex can influence stalling and associated genome instability (Osmundson et al., 2017; Steinacher et al., 2012; Tran et al., 2017), we constructed yeast strains with tRNAGLU08 inserted so that collision between restarted replication and transcription complex would either be co-directional (tRNAGLU08CD) or head-on (tRNAGLU08HO) (Figure 5A). In the absence of RTS1-AO, there was little difference in the recombination frequency between strains with and without tRNAGLU08CD, whereas with tRNAGLU08HO there was a modest 1.5-fold increase in Ade+ recombinants (Figure 5B). A similar pattern was seen in the strains with RTS1-AO, although in this case the fold increase in Ade+ recombinants with tRNAGLU08HO was higher (2.3-fold) (Figure 5C). These data indicate that head-on collision between a restarted replication complex and a Pol III complex can trigger TS. Effect of tRNAGLU08CD and tRNAGLU08HO on TS downstream of RTS1. (A) Schematic showing the position of tRNAGLU08CD/HO within the direct repeat recombination reporter 12.4 kb downstream of RTS1. (B) Ade+ recombinant frequencies for strains MCW7229, MCW7434 and MCW7433. (C) Ade+ recombinant frequencies for strains MCW7259, MCW7521 and MCW7517. (D) Ade+ recombinant frequencies for strains MCW7433, MCW9381, MCW9383, MCW7517, MCW9360 and MCW9361. Data are mean values ± SD. Ade+ recombinant frequencies with statistical analysis are also shown in Supplementary file 1. We next investigated whether loss of Pfh1 would further exacerbate TS induced by tRNAGLU08HO. In the absence of RTS1, both pfh1-m21 and pfh1-mt* mutants caused a marked increase in Ade+ recombinants (17.3-fold and 31.6-fold, respectively) consistent with previous findings (Steinacher et al., 2012) (Figure 5D). However, in the presence of RTS1-AO, the fold change in TS in pfh1-m21 and pfh1-mt* mutants compared to wild-type was essentially the same with and without tRNAGLU08HO (compare data in Figure 2B and Figure 5D). These data suggest that Pfh1 is not needed to suppress TS induced by head-on collision between a restarted replication complex and a Pol III complex. The RecQ family DNA helicase Rqh1 has been shown to limit ectopic recombination at the RTS1 RFB (Ahn et al., 2005; Lambert et al., 2010; Lorenz et al., 2009; Pietrobon et al., 2014). To investigate whether it also affects TS associated with restarted DNA replication, we compared the frequency of Ade+ recombinants in a wild-type and rqh1∆ mutant at the 12.4 kb reporter site (Figure 6C). This analysis revealed a 2.9-fold increase in recombinants in the mutant, indicating that Rqh1 plays a role in limiting TS. However, whereas the fold increase in recombinants at 12.4 kb is similar to that for spontaneous recombination at the 0 kb reporter site (Figure 6A,C), it is significantly less than the 10-fold increase seen at the 0 kb site when RTS1-AO is flanked by the ade6- repeats (Figure 6B, Figure 6—figure supplement 1). Rqh1 is not required for replication restart at RTS1 (Lambert et al., 2010) and, therefore, the lower fold increase in recombinants at the 12.4 kb reporter site, compared to the 0 kb site, suggests that Rqh1 plays a more important role in limiting ectopic recombination during replication restart than in controlling TS associated with restarted replication. Effect of rqh1∆, srs2∆, fbh1∆, fml1∆, mus81∆, pcf1∆ and pcf2∆ on TS recombination at and downstream of RTS1. (A) Ade+ recombinant frequencies for strains MCW4712, MCW1443, FO1748, FO1814, MCW3059, MCW1451, MCW6972 and MCW7147. (B) Ade+ recombinant frequencies for strains MCW4713, MCW1447, FO1750, FO1816, MCW3061, MCW1452, MCW7213 and MCW7149. (C) Ade+ recombinant frequencies for strains MCW7259, MCW8201, MCW8200, MCW8227, MCW8193, MCW8195, MCW8359 and MCW8360. Data are mean values ± SD. Ade+ recombinant frequencies with statistical analysis are also shown in Supplementary file 1. It has been proposed that Rqh1 limits ectopic recombination at the RTS1 RFB by unwinding D-loops formed by Rad51, and that this activity is counteracted by chromatin assembly factor 1 (CAF1) (Pietrobon et al., 2014). Our analysis of null mutants of two of the three CAF1 subunits (Pcf2 and Pcf3) reveals little or no change in spontaneous recombination at the 0 kb reporter but an approximately 3-fold reduction in gene conversions and ~30% reduction in deletions when RTS1-AO is present (Figure 6A,B, Figure 6—figure supplement 1). We also observed a 2-fold reduction in gene conversions and a 4-fold reduction in deletions in both pcf2∆ and pcf3∆ mutants downstream of RTS1-AO at the 12.4 kb reporter (Figure 6C, Figure 6—figure supplement 1). These data confirm that CAF1 promotes ectopic recombination associated with restarting replication at the RTS1 RFB. Moreover, considering that CAF1 is not required for replication restart (Pietrobon et al., 2014), our data show that it also promotes TS associated with restarted replication. The DNA helicases Srs2 and Fbh1, which are members of the UvrD family of proteins, are known regulators of Rad51-mediated recombination, especially at sites of replication fork stalling and collapse (Chiolo et al., 2007; Fugger et al., 2009; Lorenz et al., 2009; Marini and Krejci, 2010; Morishita et al., 2005; Osman et al., 2005; Simandlova et al., 2013; Tsutsui et al., 2014). Although a previous study showed that both proteins limit ectopic recombination at the RTS1 RFB (Lorenz et al., 2009), it was not known whether they have a similar influence on TS associated with restarted replication. To investigate this, we compared the frequency of inter-repeat recombination at and downstream of RTS1-AO in both srs2∆ and fbh1∆ mutants (Figure 6B,C). In the case of srs2∆, there was a similar 6-fold increase in Ade+ recombinants at both 0 kb and 12.4 kb reporters, which was also similar to the fold increase in spontaneous recombination at the 0 kb reporter containing RTS1-IO (Figure 6A,B,C). Unlike a srs2∆ mutant, fbh1∆ does not exhibit an increase in spontaneous recombination at the 0 kb reporter (Figure 6A) (Lorenz et al., 2009). However, when RTS1-AO is present, fbh1∆ causes an even greater increase in Ade+ recombinants at both 0 kb and 12.4 kb reporters than srs2∆ (Figure 6B,C). Altogether these data show that both Srs2 and Fbh1 strongly inhibit TS recombination associated with restarted replication. It has been reported that Srs2 is needed to promote efficient replication restart at RTS1 (Inagawa et al., 2009; Lambert et al., 2010) and, therefore, the increase in TS we observe at the 12.4 kb reporter in a srs2∆ mutant may be an underestimate of Srs2’s importance in suppressing TS. In S. cerevisiae, the FANCM-related DNA helicase Mph1 and structure-specific nuclease Mus81 have both been shown to affect levels of TS associated with BIR, with the former promoting TS and the latter limiting it (Mayle et al., 2015; Stafa et al., 2014). To see if S. pombe Mph1 (termed Fml1) and Mus81 similarly affect TS associated with replication restart at RTS1, we compared the frequency of inter-repeat recombination at and downstream of RTS1-AO in both fml1∆ and mus81∆ mutants (Figure 6B,C). As reported previously, loss of fml1 results in an almost 10-fold reduction in gene conversions at the 0 kb reporter whilst the frequency of deletions remains unchanged (Figure 6B, Figure 6—figure supplement 1) (Sun et al., 2008). Spontaneous recombination at the 0 kb reporter is similarly affected by fml1∆, albeit the fold reduction in gene conversions (~2.6-fold) is not as great (Figure 6A). 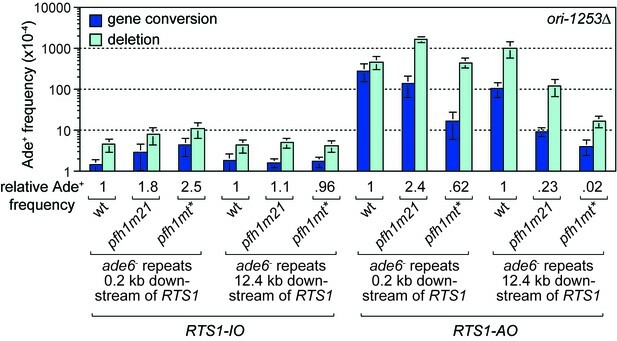 In contrast, there is little change in the frequency of Ade+ recombinants at the 12.4 kb reporter downstream of RTS1-AO (Figure 6C, Figure 6—figure supplement 1). Deletion of mus81 has no effect on the frequency of gene conversions at either 0 or 12.4 kb reporters, but does cause a slight increase in deletions (~1.4-fold) at the 0 kb reporter and a decrease in deletions (~1.5-fold) at the 12.4 kb reporter (Figure 6BC, Figure 6—figure supplement 1). The absence of any major change in TS frequency at the 12.4 kb reporter, in both the fml1∆ and mus81∆ mutant, could be due to a change in restart efficiency offsetting a potential decrease or increase in TS. However, 2DGE of replication intermediates at and around RTS1-AO reveals wild-type levels of large Y-shaped and double Y-shaped DNA molecules, suggesting that restart is unaffected by loss of either Fml1 or Mus81 (Figure 6—figure supplement 2). The factors affecting TS associated with recombination-mediated DNA replication have hitherto been studied mainly in the context of BIR in S. cerevisiae and outside of S-phase. In our study we have measured TS associated with RDR from a collapsed, yet unbroken, replication fork in S. pombe. With this system, we have identified similarities with BIR in S. cerevisiae, as well as some potential differences. To place our findings into a conceptual framework, we will first discuss a hypothetical model for TS, which is elaborated from a previous model (Figure 7) (Nguyen et al., 2015). We envisage that the collapsed replication fork regresses to form a classic ‘chicken foot’ structure with an exposed ssDNA tail formed by the nucleolytic activity of the Mre11-Rad50-Nbs1-Ctp1 complex and Exo1 (Figure 7, step 1) (Teixeira-Silva et al., 2017). Rad51 loads onto the ssDNA tail to form a nucleoprotein filament that first locates a homologous duplex and then invades it to form a D-loop (Figure 7, step 2). Pol∂ extends the 3’ end of the invading strand (Miyabe et al., 2015) and, as it does, the D-loop moves in tandem (Figure 7, step 3) (Saini et al., 2013). Although not shown in Figure 7, lagging strand DNA synthesis may be established on the nascent leading strand giving rise to conservative replication, which could then be directed into semi-conservative replication by branch migration of the regressed replication fork behind the D-loop (Nguyen et al., 2015). Such a model would be compatible with the finding that RDR, triggered by fork collapse at RTS1, is semi-conservative (Miyabe et al., 2015), and contrasts with BIR, which is conservative (Donnianni and Symington, 2013; Saini et al., 2013). As DNA replication progresses, the associated migrating D-loop is likely to be susceptible to dissociation, either through the action of DNA helicases and/or by branch migration of the regressed replication fork ‘catching up’ with it (Nguyen et al., 2015). Dissociation of the D-loop in a region of repetitive DNA would lead to TS if the ejected DNA strand re-invades the ‘wrong’ repeat (Figure 7, steps 4 and 5; note that the DNA repeats, in yellow, are directly orientated as they are in our genetic assay). 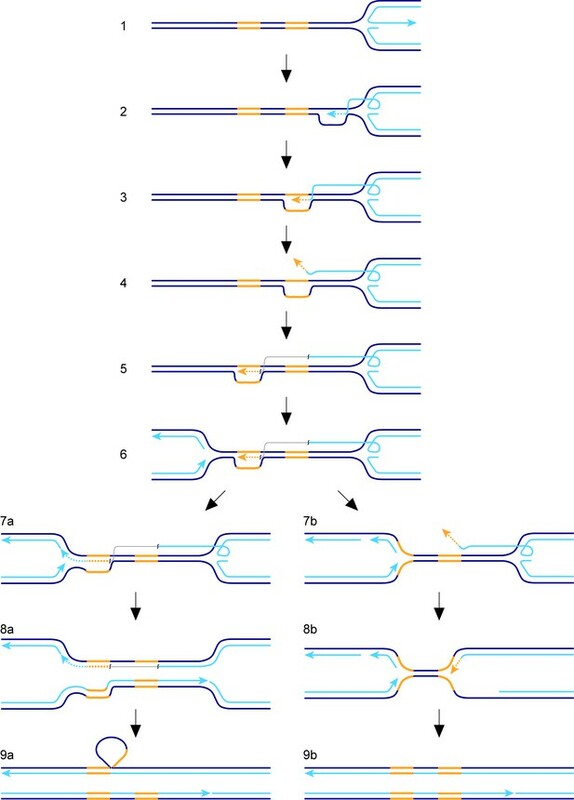 RDR is terminated upon encounter with the oncoming replication fork (Figure 7, steps 6 and 7) and, during this process, the invading DNA strand may either be ligated to the nascent lagging strand of the oncoming fork (Figure 7, step 7a) or be unwound (Figure 7, step 7b). If unwound, a second TS may be triggered (not shown) or the regressed replication fork may simply re-set by branch migration and merge with the oncoming fork (Figure 7, steps 8b and 9b). Note that these events can give rise to a gene conversion in our genetic assay (Figure 1B). Ligation of the invading DNA strand to the nascent lagging strand of the oncoming fork would prevent further TS and consolidate the formation of a deletion, with branched DNA structures being resolved by nucleases (not shown) (Lorenz et al., 2009) or by the completion of DNA replication (Figure 7, steps 8a and 9a). In the latter case, the region being deleted would form a heterologous loop of ssDNA (Figure 7, step 9a), which could be removed by a large DNA loop repair pathway (Clikeman et al., 2001; Sommer et al., 2008). Model for TS between direct repeats. Parental DNA strands are dark blue, nascent DNA strands are light blue and DNA repeats are yellow. The grey line in steps 5, 6, 7a and 8a indicates that the light blue and yellow lines, which it connects, are continuous. See main text for a step-by-step description of the model. TS associated with BIR in S. cerevisiae is thought to reflect an inherent instability of the migrating D-loop, which has evolved to encourage DSB repair by synthesis-dependent strand annealing (Smith et al., 2007). The observation that TS in S. cerevisae is constrained to the first 10 kb of template DNA that is copied, suggests that the D-loop eventually matures into a more stable structure (Mayle et al., 2015; Smith et al., 2007). This maturation process may involve cleavage of the D-loop by structure-specific nucleases such as Mus81 (Mayle et al., 2015; Osman and Whitby, 2007). Our finding that TS downstream of RTS1-AO is generally biased in favour of deletions, whereas at the RFB gene conversions predominate, suggests that the frequency of double TS events declines soon after replication has restarted. Interestingly, Carr and colleagues reported that the propensity for restarted replication to perform a U-turn at small inverted repeats positioned downstream of RTS1 declined 4-fold when the distance between RFB and repeats was increased from 0 to 2 kb, and then appeared to plateu (Mizuno et al., 2013). These observations suggest that the putative migrating D-loop, which is formed following replication fork collapse at RTS1-AO, undergoes partial stabilization shortly after it is formed. However, unlike with BIR in S. cerevisiae, a degree of D-loop instability must be retained because we can detect TS over distances of at least 75 kb downstream of the site of fork collapse. Our finding, that tRNAGLU08HO increases TS downstream of RTS1-AO, suggests that head-on collisions with transcription complexes might exacerbate D-loop instability and be a key trigger in promoting TS. The apparent disparity in D-loop maturation, between BIR in S. cerevisiae and RDR in S. pombe, may reflect differences in D-loop processing. In S. cerevisiae, Mus81 constrains TS during BIR presumably by resolving the D-loop into a more stable fork structure (Mayle et al., 2015). However, in S. pombe, we found no evidence that Mus81 is required to constrain TS during RDR. In fact the only constraint, over the region in which TS can occur in S. pombe, seems to be the point at which the restarted replication converges with the oncoming replication fork - a property which is shared with BIR in S. cerevisiae (Mayle et al., 2015; Nguyen et al., 2015). TS associated with restarted replication is thought to be responsible for generating many of the genome rearrangements that are associated with cancer and other disease states (Carvalho and Lupski, 2016; Hastings et al., 2009). However, some complex genome rearrangements can span distances of hundreds of kilobases and, therefore, could not be formed from a single restarted replication event if TS was limited to a 10 kb region downstream of the site of fork collapse (Hastings et al., 2009). Our finding, that TS events occur over a much greater distance in S. pombe than they do for BIR in S. cerevisiae, shows that TS, associated with the repair of a single collapsed replication fork, may be capable of generating some of the long-range and complex genome rearrangements seen in humans. Similar to BIR in S. cerevisiae, the Pif1 family DNA helicase Pfh1 promotes RDR, which explains why there is a general reduction in the levels of TS downstream of RTS1-AO in pfh1-m21 and -mt* mutants. In S. cerevisiae, Pif1 aids DNA synthesis during BIR by driving D-loop migration (Wilson et al., 2013), and Pfh1 might do likewise during RDR in S. pombe. 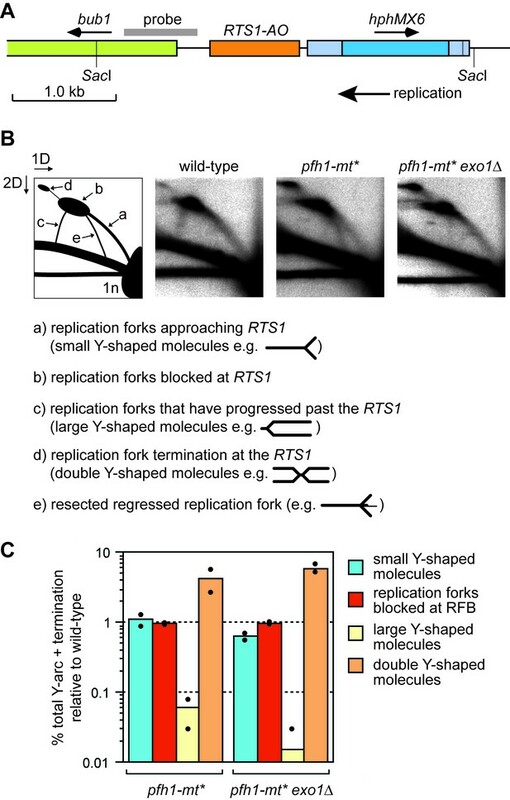 Moreover, our observation, that resected regressed replication forks accumulate at RTS1-AO in a pfh1-mt* mutant, suggests that Pfh1 is a candidate for promoting the putative branch migration and/or re-setting of the regressed replication fork behind the migrating D-loop (see Discussion above). Pfh1 also has the ability to drive DNA replication by dislodging protein-DNA barriers via its so-called sweepase activity (Sabouri et al., 2012; Steinacher et al., 2012). Efficient RDR past RTS1 presumably requires removal of the barrier protein Rtf1, which may depend on Pfh1’s sweepase activity. Despite Pfh1 being needed for efficient RDR, we were able to detect an increase in TS in a pfh1-m21 mutant if we provided more time for replication restart to occur, which shows that Pfh1, in addition to promoting RDR, also plays a role in suppressing TS. This finding contrasts with BIR in S. cerevisisae where Pif1 has no affect on TS (Stafa et al., 2014). Unlike S. pombe and humans, which have only one Pif1 family helicase, S. cerevisiae has a second Pif1 helicase called Rrm3, which, whilst seemingly not required for BIR, is important for the repair of replication-associated DSBs as well as replication past stable protein-DNA complexes (Ivessa et al., 2003; Muñoz-Galván et al., 2017; Wilson et al., 2013). It is possible that Pif1 and Rrm3 act redundantly in the suppression of TS in S. cerevisiae. Alternatively, the role of Pif1 helicases in suppressing TS may only be evident when RDR acts during S-phase alongside ongoing canonical DNA replication. Specifically, they may play an important role in directing the termination of DNA replication where a canonical fork encounters a D-loop. We speculate that Pfh1 drives D-loop dissociation during termination through its action as an accessory helicase at the oncoming DNA replication fork, where it likely translocates on the lagging template strand in a 5’ – 3’ direction (i.e. towards the D-loop and on the same DNA strand that the invading strand is annealed to) (Sabouri, 2017) (Figure 7, step 7b). Without this activity there would be a greater tendancy for the 3’ end of the invading strand at the D-loop to ligate to the lagging strand of the oncoming fork, which would specifically favour deletion formation in our genetic assay (Figure 7, steps 7a – 9a). 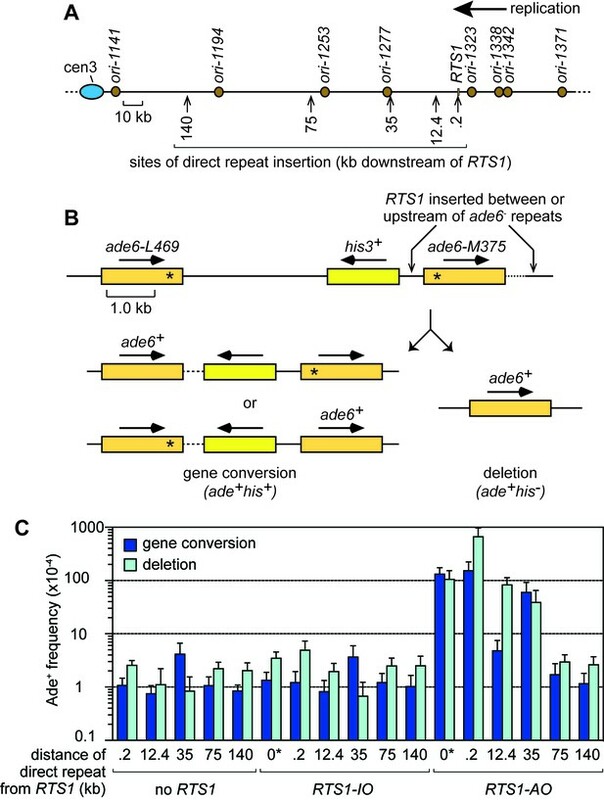 Indeed, in the instances where we can detect an increase in Ade+ recombinants when pfh1 is mutated, it is specifically deletions that increase, with the frequency of gene conversions either decreasing or remaining unchanged (Figure 2, Figure 2—figure supplement 1, Figure 4, Figure 4—figure supplement 1). In addition to Pfh1, we have identified a further three conserved DNA helicases that suppress TS downstream of RTS1-AO, namely Rqh1, Srs2 and Fbh1. These helicases, and their homologues in other organisms, are well known as major players in directing the outcome of homologous recombination reactions (Doe and Whitby, 2004; Fugger et al., 2009; Kohzaki et al., 2007; Larsen and Hickson, 2013; Lorenz et al., 2009; Morishita et al., 2005; Niu and Klein, 2017; Osman et al., 2005; Simandlova et al., 2013; Tsutsui et al., 2014). However, their role in suppressing TS downstream of a collapsed replication fork has not previously been demonstrated, though it has been suggested that the homologue of Rqh1 in S. cerevisiae (Sgs1) might limit translocations between highly diverged genes by suppressing TS during BIR (Schmidt et al., 2006). Based on the known activities of their homologues, Rqh1, Srs2 and Fbh1 have the potential to influence TS in various ways. For example, Sgs1 and its human homologue BLM, as well as S. cerevisiae Srs2, are capable of dissociating D-loops in vitro (Bachrati et al., 2006; Bugreev et al., 2007; Dupaigne et al., 2008; Fasching et al., 2015; Liu et al., 2017; van Brabant et al., 2000). The dissociation of a nascent D-loop can abort a TS event before a genetic change is made (e.g. a deletion or gene conversion in our genetic assay) and, therefore, the loss of this activity might account for the increase in TS we observe in both rqh1∆ and srs2∆ mutants (Figure 5). Indeed, Lambert and colleagues showed that Rqh1 was responsible for the disappearance of recombination intermediates at RTS1 in cells lacking CAF1, and proposed that this was due to its ability to drive D-loop dissociation (Pietrobon et al., 2014). Another way in which Rqh1 may affect TS is by catalyzing the branch migration of the regressed replication fork behind the migrating D-loop. The regressed fork forms a four-way/Holliday junction, which is a structure that several RecQ–type helicases have been shown to unwind/branch migrate in vitro (Cejka and Kowalczykowski, 2010; Karow et al., 2000; LeRoy et al., 2005; Machwe et al., 2011). As discussed above, branch migration of the four-way junction into the ‘back’ of the D-loop would cause the D-loop to unwind. This might happen more frequently during an attempted TS event if the four-way junction continues to migrate whilst the D-loop is being re-established. In S. cerevisiae, Rad51 promotes strand re-invasion, leading to a TS event during BIR (Anand et al., 2014). Presumably, Rad51 loads onto the ejected DNA strand following dissociation of the migrating D-loop to form a nucleoprotein filament. Both Srs2 and Fbh1 regulate nucleoprotein filament formation by dissociating Rad51 from DNA (Krejci et al., 2003; Simandlova et al., 2013; Tsutsui et al., 2014; Veaute et al., 2003). The loss of this anti-recombinogenic activity might account for the increase in TS observed in srs2∆ and fbh1∆ mutants. Whilst dissociation of a nascent D-loop might prevent TS recombination, the unwinding of a fully established migrating D-loop would promote it. Indeed, this is exactly the activity that Mph1 is thought to catalyze during BIR in S. cerevisiae (Stafa et al., 2014). Surprisingly, we found that Fml1, despite promoting ectopic recombination during the restart of replication, appeared to have no effect on TS once replication had restarted. It is possible that a reduction in TS caused by lower levels of migrating D-loop dissociation is offset by an increased number of D-loops reaching our 12.4 kb genetic reporter. We are currently developing methods to measure restarted replication tract lengths, which will allow us to better calibrate our TS data. In conclusion, we have identified a number of factors that influence TS associated with replication restart from a collapsed replication fork, revealing both similarities and potential differences with TS during BIR in S. cerevisiae. The fact that S. pombe and S. cerevisiae are only distant relatives, being about as divergent from each other as each is to animals (Heckman et al., 2001; Sipiczki, 2000), means that the similarities we have reported (e.g. Pif1 helicases promoting replication restart) are likely to be conserved in humans. Even the apparent disparities may simply reflect differences in the recombination assays used rather than fundamental mechanistic differences between RDR in S. pombe and S. cerevisiae. This is exemplified in S. cerevisiae, where the importance of Mus81 in limiting TS during BIR appears to depend on the recombination assay (Mayle et al., 2015; Stafa et al., 2014). In future studies, it will be important to establish whether the apparent disparities between RDR in S. pombe and BIR in S. cerevisiae reflect real species-specific differences, fundamental differences in the restart of replication from a DSB/broken replication fork versus a collapsed, yet unbroken, fork or simply differences in the recombination assays that have been used. S. pombe strains and oligonucleotides are listed in Supplementary files 2 and 3, respectively. The construction of the ‘0 kb’ recombination reporter, with RTS1 positioned between the direct repeat of ade6- heteroalleles, has been described (Ahn et al., 2005). To integrate the ade6- direct repeat recombination reporter ~35 kb, ~75 kb and ~140 kb downstream of the normal ade6 locus, we used essentially the same strategy that was used previously to integrate the reporter at the 12.4 kb site (Nguyen et al., 2015), with the only difference being the construct used for targeted integration of ade6-M375::kanMX6. For targeted integration of ade6-M375::kanMX6 at the 35 kb site we constructed pMJ33, which is a derivative of pMW923 (Nguyen et al., 2015) containing ade6-M375::kanMX6 flanked by DNA fragments amplified from genomic DNA using primers oMW1659 plus oMW1660 and oMW1661 plus oMW1662. pMJ34 and pCB44, which were used for targeted integration of ade6-M375::kanMX6 at the 75 kb and 140 kb sites respectively, are similar to pMJ33 but contain genomic DNA fragments that were amplified using oMW1663 plus oMW1664 and oMW1665 plus oMW1666 (pMJ34) or oMW1621 plus oMW1622 and oMW1623 plus oMW1624 (pCB44). In each case, the targeting construct was liberated from its host plasmid by digestion with SpeI and PvuII. The strains with tRNAGLU08CD or tRNAGLU08HO, at the 12.4 kb ade6- direct repeat recombination reporter site, were constructed in the same way as the standard 12.4 kb reporter strain using pMW899 or pMW905 instead of pFOX2 (Nguyen et al., 2015; Steinacher et al., 2012). Plasmids were verified by DNA sequencing and strains were verified by diagnostic PCR. Protocols for the growth and genetic manipulation of S. pombe, and assays for recombination have been described (Morrow et al., 2017; Nguyen et al., 2015). Between 3 and 10 colonies were assayed in each recombination experiment, with experiments repeated at least three times to achieve a minimum sample size as calculated using the Power calculation n = f(α,β)(2 s2/δ2) where α = 0.05; β = 0.1; s = 40; and δ = 50. Strains being directly compared were analysed at the same time in parallel experiments. Statistical analysis of the recombination data was performed in SPSS Statistics Version 22 (IBM). Each data set was tested for normal distribution using a Shapiro-Wilk test, rejecting the null hypothesis (H0; ‘data fits a normal distribution’) at an α-level of p < 0.05. Several data sets did not conform to a normal distribution and, therefore, all comparisons were done using a two-tailed, two independent sample Wilcoxon rank-sum test (also known as the Mann-Whitney U test). This test is non-parametric and does not depend on data sets being normally distributed. Sample sizes and p values are given in Supplementary file 1. Genomic DNA was prepared from asynchronously growing yeast cultures by enzymatic lysis of cells embedded in agarose and run on 2D gels as described (Nguyen et al., 2015). The 32P-labelled probe for the 2D gel in Figure 3 was made by random prime labeling using a template amplified from genomic DNA using primers oMW706 plus oMW707. The probe for the 2 D gel in Figure 6—figure supplement 2 has been described (Ahn et al., 2005). Annual Review of Genetics 47:1–32. Cold Spring Harbor Perspectives in Biology 5:a010397. Current Opinion in Genetics & Development 22:204–210. Journal of Biological Chemistry 285:8290–8301. Molecular and Cellular Biology 27:7439–7450. The Journal of Cell Biology 186:655–663. Molecular and Cellular Biology 27:2812–2820. Annual Review of Genetics 38:233–271. Advances in Experimental Medicine and Biology 767:161–184. Molecular and Cellular Biology 29:4742–4756. Nature Structural & Molecular Biology 22:932–938. Molecular and Cellular Biology 25:8074–8083. FEMS FEMS Yeast Res 17:efow111. Molecular and Cellular Biology 25:8084–8096. Nature Structural & Molecular Biology 24:162–170. Molecular and Cellular Biology 28:6594–6608. Critical Reviews in Biochemistry and Molecular Biology 52:395–413. Journal of Biological Chemistry 288:34168–34180. Journal of Cell Science 127:2983–2994. Thank you for submitting your article "Factors affecting template switch recombination associated with restarted DNA replication" for consideration by eLife. Your article has been reviewed by two peer reviewers, one of whom is a member of our Board of Reviewing Editors, and the evaluation has been overseen by Detlef Weigel as the Senior Editor. The following individuals involved in review of your submission have agreed to reveal their identity: Gregory Ira (Reviewer #1). In this new manuscript the authors investigate the repair of stalled forks in fission yeast with a system where polar replication fork blockage – RTS1 sequence – is placed downstream from a set of early firing origins. RTS1 is known to stimulate recombination and the authors previously demonstrated that RTS1 stimulates locally also template switches. The role of multiple enzymes in template switches at the site of the fork stalling is investigated. Template switches are scored as frequency of recombination between two Ade- alleles located downstream from RTS1 that generates ADE+ colonies. The reporter cassette was placed at different distance from the fork stalling sequence and in some experiments the authors additionally modified the experimental system by deleting upstream origins, inserting a tRNA gene or replication that result in a delay of converging forks. The authors provide convincing evidence suggesting that Pfh1 helicase is important for TS particularly further from the site of RTS1. This indicates that Pfh1 similar to Pif1 in budding yeast could be involved in repair specific extensive DNA synthesis. Furthermore the authors find a role of DNA helicases Srs2, Rqh1 and Fbh1 in controlling TS accordingly to previously documented functions of these helicases in regulation of recombination intermediates. Interestingly Fml1, a helicase that these authors and others showed to regulate D-loop stability has no function in limiting TS. Also Mus81 does not have a role in repair and TS frequency at stalled forks. The authors also show that TS can occur even far away from fork stalling place (75 kb) in case where there is no efficient converging fork. Overall the manuscript provides new and interesting data on a topic that is important in genome instability field. The data are of high quality and the manuscript is well written. We note, however, that many of the effects in the mutants are small (and barely significant) and alternative models should be considered. Moreover, the effect of the tRNA gene on TS is not well connected to the rest of the manuscript. 1) You must reconsider how you discuss and compare your data with data obtained in other organisms. You should be more careful when comparing genetic requirements for template switches at nick induced recombination, in recombination at stalled replication forks and in BIR that occurs in G2. You make strong conclusions about the differences in control of TS between budding yeast and fission yeast but the differences in some of the phenotypes may be simply related to different recombination assays used and not different organisms as is claimed. Even within budding yeast depending on the recombination system use, the role of DNA helicases and nucleases in template switches and BIR is different. For example some BIR events in budding yeast depend on Mus81 while others do not and similarly TS are regulated by Mus81 or not depending on the assay. Stafa et al. showed that Mus81 is not regulating template switching during BIR while Mayle et al. showed that Mus81 suppresses template switching in recombination induced by nicks. Work from Russell and Arcangioli labs clearly demonstrated the function of Mus81 in repair of nick induced breaks in fission yeast. Others demonstrated similar function of Mus81 in budding yeast and other organisms. In the assay used here, all repair processes seem to be possible without any contribution of Mus81 so it is somewhat difficult to compare these results with assays where Mus81 is essential. Also Fml1, similar to budding yeast, Mph1 may play a role in TS in fission yeast but in BIR and not at stalled forks. A fair comparison between budding yeast and fission yeast would require related recombination assays. Thus all strong statements on differences between organisms should be toned down unless you compare similar recombination assays. 2) The tRNA gene data are not well connected to the rest of the manuscript. A better connection could be made by introducing the pfh1, rqh1, srs2, fbh1, fml1, mus81, pcf2, and pcf3 mutants into this assay. 1) You must reconsider how you discuss and compare their data with data obtained in other organisms. You should be more careful when comparing genetic requirements for template switches at nick induced recombination, in recombination at stalled replication forks and in BIR that occurs in G2. […] A fair comparison between budding yeast and fission yeast would require related recombination assays. Thus all strong statement on differences between organisms should be toned down unless you compare similar recombination assays. To better integrate the tRNA gene data we have analysed the effect of pfh1-m21 and pfh1-mt* mutants on TS at the 12.4 kb reporter containing tRNA-HO. These new data are presented in a new version of Figure 4, which incorporates data from the original version of Figure 6 (note that in this re-organisation of the paper the original Figure 5 is now Figure 6). Our new data show that the pfh1 mutants exhibit heightened levels of spontaneous recombination when tRNA-HO is present but, surprisingly, with RTS1-AO they exhibit the same fold increase in TS relative to wild-type as they do without tRNA-HO (compare Figure 2B and Figure 5D). These data suggest that Pfh1 is not required for limiting tRNA-HO-induced TS. We are grateful to Eleanor Hanson, Felix Kirsten and Kelly Lau for help in constructing and assaying some of the strains used in this study. We also thank Yota Murakami for the gift of the pcf2∆::kanMX6 and pcf3∆::LEU2 strains. © 2019, Jalan et al. Michael O Nguyen et al. The completion of genome duplication during the cell cycle is threatened by the presence of replication fork barriers (RFBs). Following collision with a RFB, replication proteins can dissociate from the stalled fork (fork collapse) rendering it incapable of further DNA synthesis unless recombination intervenes to restart replication. We use time-lapse microscopy and genetic assays to show that recombination is initiated within ∼10 min of replication fork blockage at a site-specific barrier in fission yeast, leading to a restarted fork within ∼60 min, which is only prevented/curtailed by the arrival of the opposing replication fork. The restarted fork is susceptible to further collapse causing hyper-recombination downstream of the barrier. Surprisingly, in our system fork restart is unnecessary for maintaining cell viability. Seemingly, the risk of failing to complete replication prior to mitosis is sufficient to warrant the induction of recombination even though it can cause deleterious genetic change.